This course is open to the university students/ faculty/ researchers and their spouses. In this course, we will focus on the second half of the contents of the textbook “Marugoto”. This time, we hold two courses, and they are the same contents. Please apply for your desired course. 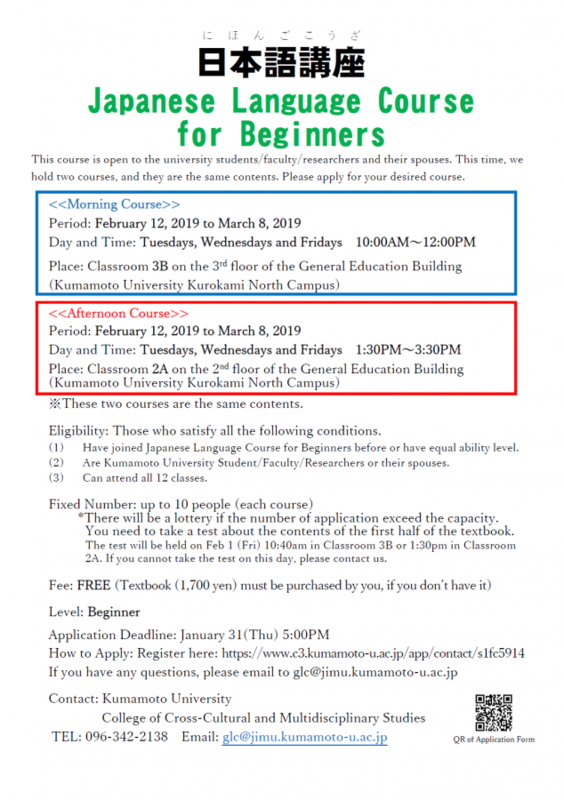 (1) Have joined Japanese Language Course for Beginners before or have equal ability level. (2) Are Kumamoto University Student/Faculty/Researchers or their spouses. (3) Can attend all 12 classes. *There will be a selection if the number of application exceed the capacity. You need to take a test about the contents of the first half of the textbook. The test will be held on February 1 (Fri) 10:40AM in Classroom 3B and 1:30PM in Classroom 2A. If you cannot take the test on this day, please contact us. Application Deadline: January 31(Thu.) 5:00 p.m.